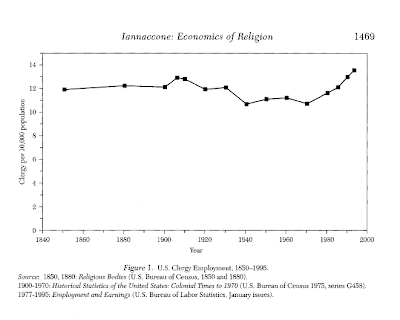 One of the key empirical facts in the sociology of religion is whether countries (groups, people) are getting more or less religious over time. If they are getting less religious, then that would support secularization theories. If they are getting more religious, that would support rational choice theories (which say more freedom of religion = more participation). In the context of this debate, Iannaccone put together the above figure. It plots the number of employed pastors per 10,000 people in the United States since 1850! He collected data from the US Census and Bureau of Labor Statistics. This measure avoids some of the problems associated with self-reported church attendance. It turns out that there have been about 1.2 pastors for every thousand people during the whole period. The stability is remarkable (though perhaps not satisfying for either secularization or rational choice theorists). In the church, there's often a lot of talk about how Christianity is disappearing in the U.S. While the above figure doesn't plot Christian pastors, per se, it does suggest that religion itself isn't going anywhere. What should be measured in church surveys? What should I do with my week? Why do strict churches prosper? Who files for divorce most often?